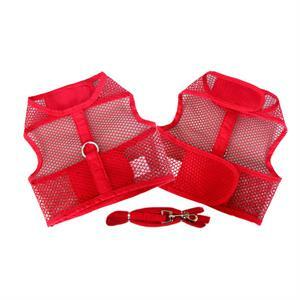 This fun and functional vest harness is a big hit with small dogs and their owners. Soft and comfortable, the harness is designed to relieve pressure from your pet's neck and throat. Using strong velcro closures, it is fully adjustable and extremely easy to put on and take off. No more hassling with traditional harnesses. Leash included. Reinforced D-ring on top of the harness makes for fun walking. Just be prepared for lots of attention and compliments! Perfect for warmer weather, but can be used all seasons. Made in the USA. Fabric: Lightweight yet sturdy black netted fabric/black trim. Care: Machine wash gentle cycle, dry flat.